“Even in the best times we've had in 30 years, still we're slowly bleeding folks with bachelor's degrees,” said economist Chad Wilkerson, who led the research. Oklahoma’s economy has rebounded since the the 2014-15 oil bust, but the state still lost thousands of working age residents from 2015 to 2017. The decrease in overall domestic migration marks a reversal from the previous ten years, but the loss of highly educated workers is an acceleration of an ongoing pattern. 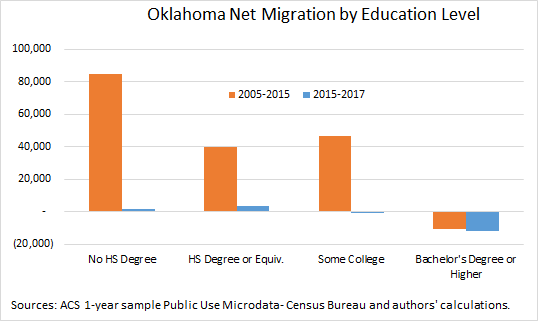 The study found Oklahoma lost about 10,000 more college graduates than it gained in the ten years from 2005 to 2015. The pace increased significantly from 2015 to 2017, resulting in a net loss of over 11,000 in just three years. Wilkerson suspects the energy industry may be driving the change. He pointed to a previous study showing the industry can now produce more with fewer workers. Wilkerson said cuts to state services, like education, could have something to do with it also. The two outliers were young people and those with limited education. 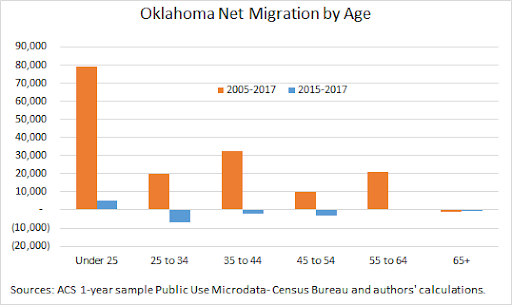 Unlike the other groups in the study, people ages 25 and under and those with a high school diploma or less continued moving to Oklahoma. A report from the U.S. Census Bureau says Oklahoma's population has grown slightly, but is trailing the national rate. Oklahoma added nearly 25,000 residents between 2013 and the middle of 2014. The growth rate of 0.6 percent is behind the national rate of 0.7 percent and well behind that in Texas, where growth was 1.7 percent. The Tulsa World reported Wednesday that Oklahoma grew at a faster pace than neighboring Arkansas, Kansas and Missouri, which grew at a rate of 0.3 percent.